Do you love fixing your hair and dressing it up stylishly? Are you a DIY hair style guru? Or maybe you just enjoy trying out the pretty and fun hair styling techniques at pinterest? Well then my dears, this contest is for YOU! 1. Log on to WWW.CANDYMAG.COM and click on the VITRESS TO IMPRESS promo tab under the BEAUTY section and REGISTER. 2. Then create an entry by taking a photo of your fab self with your VITRESSed hairstyle in high resolution not more than 1mb and upload to the website. And YES you may send multiple entries of different hairstyles! This contest is from August 1-31, 2013. So make sure you upload your photo for your contest entry within these dates. As for the prizes, well I'm pretty much sure you'd be thrilled to know that 5 WINNERS will be chosen! Each winner will get Php 5,000 Forever 21 GC, Vitress gift pack, and a spot on Candy Mag Oct issue! So what are you waiting for my dear Coffeeholics x CANDY gals? 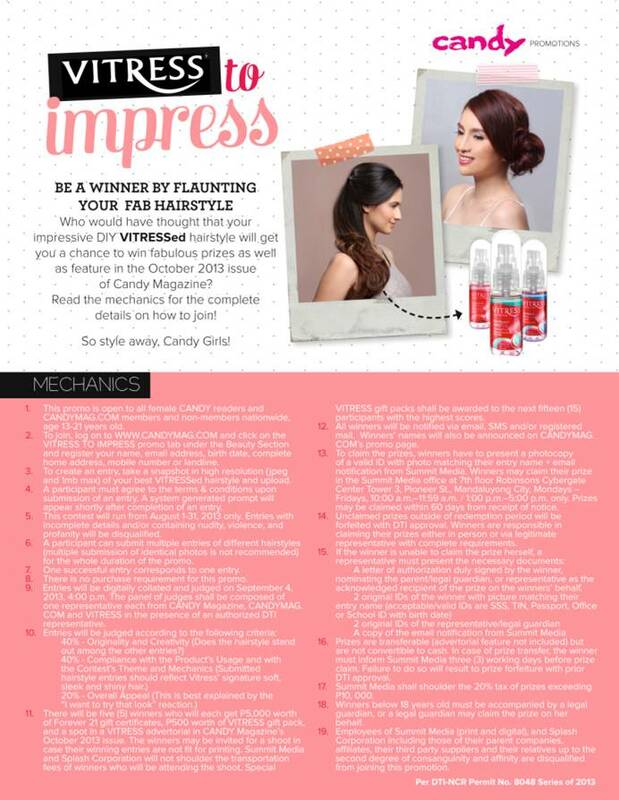 Let your inner hairstylista come out and win that spot on Candy Mag Oct issue and all those other lovely prizes! :) Have an awesome week! I'm sure a lot of ladies would be happy to join this contest for the fun of joining and the prizes.